Disclaimer: While I received this product complimentary for testing purposes, all opinions are 100% my own. Hi everyone! Fall is in full swing and I’m looking forward to the upcoming holiday season! I have unwillingly taken a break from blogging while I getting over a cold-this crazy weather didn’t help! However, the upside is that I had more time to test the product that I’m reviewing today! 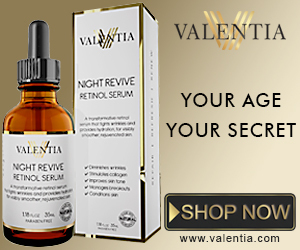 Valentia Skin Care has a new product: the Night Revive Retinol Serum! After testing this product for several weeks, I have only good things to say about it! First of all, as someone with sensitive skin, not only does it not irritate my skin, it actually helps my skin recover from irritation! My evening skincare routine is too cleanse and apply toner, then moisturize- I also exfoliate 3 times a week. I’ve noticed that when my skin seems a little irritated and red after cleansing, the next morning the irritation vanishes if I apply the Valentia Night Revive Retinol Serum. Needless to say, I am now applying this serum every night! Another bonus is the applicator, which I love because it makes it easy to control the amount of serum I want to use on different parts of my face.